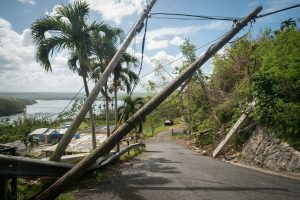 Power outages and interruptions remained a common occurrence on Puerto Rico – nearly a year after the island was devastated twice in short order by Hurricanes Irma and Maria. Nearly a year after the hurricanes, power was completely restored. As many across the U.S. watched the response efforts in the days and weeks after the storm, many on the island were barely surviving. The stories began to dissipate from the national news media, even while many were still without power. Across the island, community health centers were not immune from the power outages. Many health centers had to become sufficient on generator power and refueling for those generators wherever they could find it, as they were often not on the government’s priority lists. Health centers began opening their doors within 24 hours after the storm, and in many cases were the only available medical facilities. Additionally, they were the only facilities to have medicines as commercial pharmacies were not opening. The Asociación de Salud Primaria de Puerto Rico (ASPPR), the primary care association for the island, immediately sprang into action to assess the needs of local health centers and coordinate with federal and local response efforts, including communicating with various relief non-government organizations. The most immediate needs were water, food, diesel gas for generators (where they had them), medical supplies, medicines, and vaccinations. “[ASPPR] served as the main contact-point for various worldwide and national organizations to channel, distribute and stock medicines and health related products, worth more than $25 million for different [health centers] on the Island. The knowledge, goodwill, and resources from these organizations were key for us,” said Suarez-Fajardo. As the weeks went by there were fewer needs from the health centers in terms of supplies or medicines; deliveries were getting through, and communities were rebuilding. But consistent access to power was still limited. Many areas had regular outages throughout the day and health centers were dependent on backup generators that would kick in when the power went down. With ongoing power failures, the island’s more than 350,000 health center patients were constantly at risk of not only being in the dark but were also vulnerable to losing valuable medications that required refrigeration. “After hurricanes Irma and Maria hit Puerto Rico, widespread power outages posed serious challenges for health care organizations treating the island’s population. Diagnostic equipment no longer functioned and critical medicines and vaccines that had to be kept refrigerated were lost. Direct Relief was initially asked to provide generators and fuel for the health centers, which we did for the short-term, but the expense and delays in getting maintenance for the generators proved untenable,” Andrew MacCalla, Director of International Programs and Emergency Response, Direct Relief. 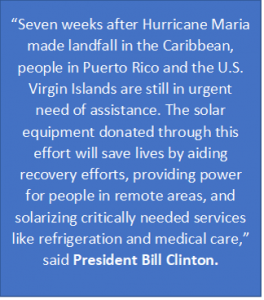 Also joining the initiative, the Hispanic Federation and New Solar Energy PR (a solar energy installer) aim to bring together the solar energy sector to restore power throughout Puerto Rico and the U.S. Virgin Islands. The effort began with more than $5 million in equipment donations from over 20 companies, including lanterns and cell phone chargers, solar water purification units, and larger equipment for solar panel installations. Other efforts from the U.S. mainland also began to come to fruition. On May 7, 2018, the Charitable Foundation for the Energy Bar Association hosted their annual gala in partnership with the ASPPR to raise funding to help provide solar panels, inverters, and battery systems to the health centers on the island, and specifically will address cooling and refrigeration needs for perishable vaccinations and medications. This has yielded $100K in donations to date. The struggle for consistent power – especially in the harder-to-reach regions that were remote, mountainous, and/or cut-off due to damage on the roads – remained months later on the island. Bringing solar energy resources to these locations allows the health centers to become more independent and resilient. “Not only will it enable these health centers to continue providing vital services to their patients without worrying about losing power, but it will be a clean energy solution that will save them money on daily electricity costs for years to come,” MacCalla indicated. In the midst of hurricane season in Puerto Rico and the U.S. Virgin Islands preparation has taken a new focus and heightened priority. Lessons learned from this past season – the most devastating in memory – is leading health centers to ensure their access to power is more resilient and that their health centers are more prepared to be without power for days, weeks, and maybe even months.